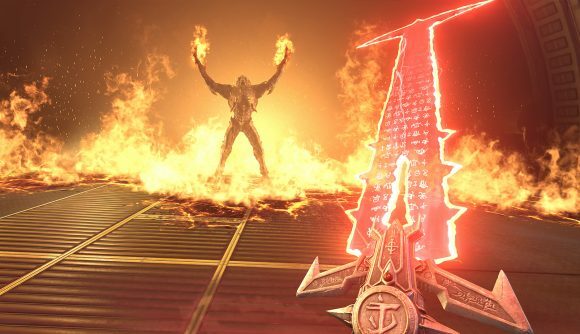 There was a lot to absorb in today’s Doom Eternal gameplay presentation, and one little detail nearly slipped under the radar – extra lives. We see the Slayer grab a 1-up during the course of the action, but didn’t get any info about how that works in-game. So we had to find out – and we did just that in a Q&A session after the QuakeCon keynote. If you’ve got an extra life, you don’t have to reload your last checkpoint when you die. Instead, when you take deadly damage, the screen desaturates and you get a few moments of invulnerability to reposition yourself and get back into the action. Extra lives are intended, in part, as an accessibility option for less skilled players. The developers say that the mouse and keyboard portion of the gameplay demo was intended to showcase the most skilled player playing the game in the most skilled way. Extra lives are a way to keep the experience from getting disrupted at a lower level of play. But that’s not to say extra lives are free. Instead, they’re a reward for exploration. Creative director Hugo Martin likens it to a reward in an old-school Nintendo game, where extra lives are often presented to players as a way to encourage them to look off the beaten path. One bit of info we don’t have is the Doom Eternal release date – but you can set your bookmarks there, resting assured that we’ll have that info and loads more as it becomes available.